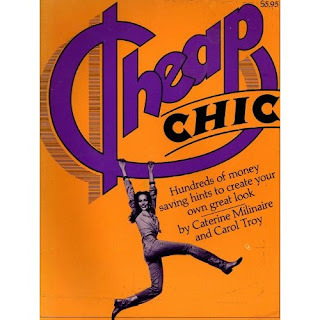 As an art student in the late 1970s, I happened across a paperback book called Cheap Chic by Caterine Milinaire and Carol Troy. I had discovered my style bible, eventually transforming it into a tattered and dog-eared thing with the corners of my favorite pages folded down. A decade later, I let it go during a misguided fit of decluttering. I've regretted it ever since. Long out of print, it now sells for ridiculous amounts at Amazon. I wish I could find it again, not because it's worth so much cash, but because the lessons it taught me are still creative and exciting. This book was the real deal. Cheap Chic was all about the principles of style. No strict rules (this was the 70s, after all), but full of lessons about embracing individual style (something of a new concept at the time), having fun with clothes, and being frugal about it at the same time. Sometimes Cheap Chic boils down to spending much more than you feel you can afford on the kind of classic, quality clothes we talk about in this chapter. We think it saves money in the long run. . . . There are still certain things you shouldn't fudge on no matter how cheaply you dress: the very best boots, a sturdy bag, a glorious jacket or shirt. You can't afford cheap boots that will last a year and then crack across the sole. If you had loads of money you could; but since you don't, spend your money where it shows the most. This defined my fashion philosophy. Looking back, I see that it was exactly in line with what my blue-collar parents taught me: buy the best you can afford and only buy what you need, then take excellent care of what you have. They also lived by a folk saying (Scandinavian, I think): "Poor people can't afford cheap shoes". I remember my father polishing his sturdy black leather work shoes to a beautiful gloss every Sunday night. I often do the same: on Sunday nights I get the urge to clean and polish my shoes, de-fuzz sweaters, and repair anything that needs a few stitches. It's very satisfying. I also fell madly in love with the look of this traditional French jeweler's smock. When I was living in Italy in my late 20s, I made a trip to Paris and-- miracle of miracles-- found one at La Samaritaine. I was thrilled, even though the chic sales assistant was utterly puzzled as to why I would want such a thing. I wore it with a long black skirt underneath and a beautiful wool Fair Isle vest on top. Why some brilliant publisher doesn't re-issue this, I don't know. I can only hope and wait. I owned this gem, too! Mine was a bright pink trade paperback. I referred to it often. I purged it many years ago and regret it. Miraculously, I found a copy of this at my local library just a couple of years ago. I say "miraculously" because libraries tend to get rid of books they consider to be outdated. I agree, it's a gem that should be re-issued. Those were the days.... I too was totally taken in by Cheap Chic, I first saw excerpts published in a magazine. Those pages were ripped out, preserved and poured over, in fact I still have them and sometimes return to them to remind myself how I felt back then. 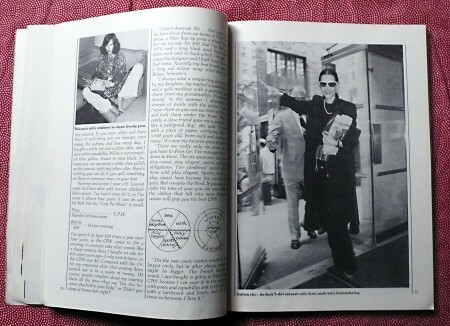 I would have given my eye-teeth to have owned a copy of the book itself, but alas had to make do with a library copy that I kept renewing until some other aspiring Fashionista complained. I tracked it down to Amazon too, but as you say it's now mighty expensive. Thanks for the memories! 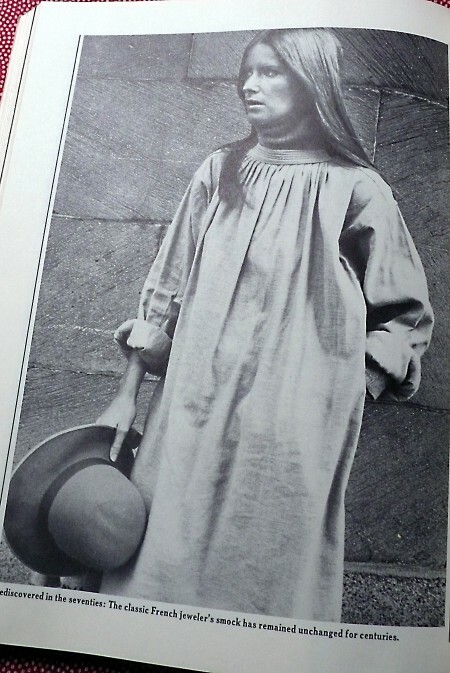 I LIVED by that book and spent a good ten years looking for the French Jewelers smock. I still google it every once in a while. Aw, thank you for linking to my post on this book. I agree it's one of the most inspiring style guides ever written. 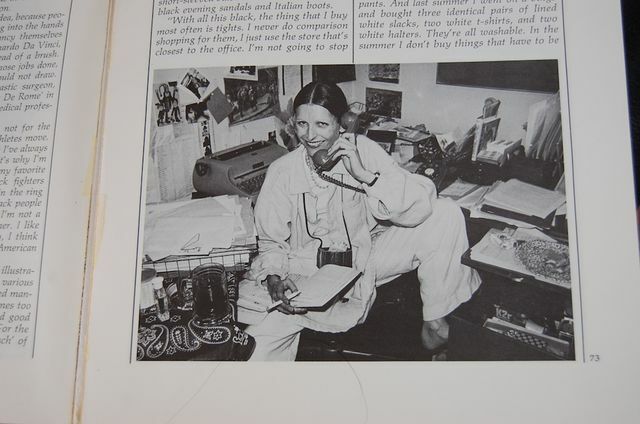 I hadn't discovered it until a few years ago but it made me want to track down these fabulous women and their wonderful wardrobes - and, yes, my very own smock. 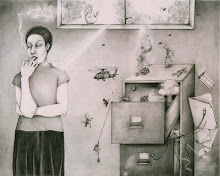 It's now fantastic to read about all the women (both in your post and in the other comments) that the book, in turn, delighted.